Arp argues that quasars are quantized: certain numbers of quasars are found at certain redshifts29. Conspicuous high numbers of quasars have been found at z= .061, .30, .60, .91, 1.41, 1.96, etc., according to K.G. Karlsson's formula (1 + z2)/(1 + z1) = 1.23. If quasars descend from (shrinking) galaxies or g-galaxies (4-1) or even superclusters, then quasars represent, in a way, a certain piece of space in the universe. Thus perhaps the universe can be divided in regions, see Fig. 5-4-I (see also 5-4). Of course Fig. 5-4-I is only 2-dimensional. If you want to know how it works 3-dimensional: buy marbles (and you will find that you can choose between 2 or 3 different layers of marbles). I will only go briefly in to this, for working this out probably takes years of research. I only want to show an example of how quasar quantization may be caused in a very simple way, so that quasar quantization can be something that no longer has to be denied (as right now in conventional science), because it can be explained very easily. Again: the example I give is just a simple example, probably the real situation is (much) different. Regions in space explaining quasar quantization. Imagine that the Earth is in the small(est) (dark) spot in the exact center of Fig 5-4-I. You see 19 of those small spots in a larger circle. Imagine that the crossing time of one small(est) spot is Δz=0.06 light years. This would make the distance from the Earth to the center of the bigger circles left and right Δz=0.3 light years and from the Earth to the bigger circles one more circle further Δz=0.6 light years, and from the Earth to the center of the biggest 6 circles surrounding the biggest inner circle Δz=0.9 light years. Imagine that the smallest circles are small clusters (or rather: certain regions, 5-4) and the bigger circles are bigger clusters and the biggest circles are “a class” bigger clusters. Universal engines (4-1) of different magnitudes are likely to end up in the center of the circles/clusters (i.e. regions). Quasars originating from universal engines (5-1) would thus be found at certain distances and thus the redshifts of quasars can be quantized. Thus quasars may be old galaxies or g-galaxies that have shrunk very much and gone the center of a certain region, which may make the redshifts of quasars quantized. Arp29 writes about a problem concerning peculiar velocities of galaxy clusters. A number of observers have reported about galaxy clusters having peculiar velocities of from 1000 to 2000 km/s. If this were true, Arp reasons, then the whole lower third of the Hubble diagram, with its small dispersion from the theoretical line, would blow up as indicated in Fig. 5-4-II. A Hubble diagram (redshift versus apparent magnitude) for clusters of galaxies. The dashed lines show the effect that nearby peculiar velocities of 1000 to 2000 km/s have on the diagram. (this picture is taken from Arp29). According to Fig. 5-4-I clusters of galaxies will have bigger peculiar velocities if they are further away in bigger regions in space (= chappells, 5-4). Clusters nearby will have lower peculiar velocities. A universe of stars clustered into galaxies and of galaxies clustered into larger systems, which in turn are clustered into yet larger systems, and so on, indefinitely, as conceived by Immanuel Kant and Johann Lambert in the eighteenth century. (this picture is taken from Harrison6). Of course, Fig. 5-4-III is, in the end, only a picture of how galaxies, clusters and superclusters are seen right now by conventional science, but still, I liked the picture by Kant and Lambert, as I liked to read about all kind of people in Harrison's book who have thought about infinite universes. If quasars can descend from galaxies and/or g-galaxies then one would expect galaxies and clusters to be quantized too. In 1990 astronomers measured many galaxies in a small field and found clumping of redshifts with main peaks around z= .06 and z= .3029, the first two peaks of the redshifts for quasars. [June 2003: For decades Arp has argued that high redshift objects interact with low redshift objects29, 72. He may be right (though I doubt it). In 6-2 it is argued that white dwarfs are not “degenerate gas” objects. Instead they are presented as objects consisting of very heavy cores with heavy elements (with relatively little or no gas surrounding the heavy element core). White dwarfs, being very compact, thus have high gravitational redshift (measured gravitational redshifts of white dwarfs range from 20 to 90 km/s8). It is also argued in 6-2 that the excess redshift of bright blue stars (in the order of 20 - 30 km/s29) too is due to big cores of heavy elements surrounded by a lot of gas. Quasars may have an extremely big heavy metal core (5-2) and thus may cause extremely strong gravitational redshift. When old galaxies or old g-galaxies turn into extremely concentrated hydrogen deficient assemblages of old blackened stars (4-1) then the gravitational redshift of such assemblages of many objects may become extremely strong. Part of the redshift of extremely compact assemblages of many objects therefore may be caused by gravitational redshift. When AGNs descend from old galaxies or old g-galaxies (5-1) then part of the redshift of many AGNs (as well as other objects that originate from old galaxies or old g-galaxies, as may be the case with NGC 7603B, 5-4) may be due to gravitational redshift. In 5-1 it is argued that there is a reason why the Broad (Emission) Line Regions (BLRs) of AGNs have physical characteristics remarkably similar to the photoionized extended envelopes of stars such as red giants and supergiants: because AGNs have a compact source, a “big ball”, that consists of many heavy element cores. This “big ball” (consisting of many smaller balls/objects) may be surrounded by a gas mantle (BLR) that acts as the photoionized extended envelopes of red giants and supergiants. [October 2003: Some quasars may be relatively small while very compact and relatively close to us, having low tired light redshift and high gravitational redshift, and some quasars may be relatively big while less compact, having high tired light redshift and low gravitational redshift. Perhaps that big quasars are often or always found far away and not nearby, because of the state of our Chappell (5-4). Therefore big quasars with low tired light redshift combined with low gravitational redshift may be unlikely. High tired light redshift and high gravitational redshift may be something unlikely too when such quasars are too small to be seen at very large distances. But perhaps there is also the possibility that very large quasars can be so compact that they have high gravitational redshift. With many smaller objects orbiting in the compact central sources of quasars/AGNs those compact central sources may have all kind of magnitudes and thus also very large magnitudes (the central compact sources of AGNs may be much larger then expected by their light flux variations so far, 5-1); this in contrast with one single compact object like a black hole or a very large star. Conventional scientists doubt the gravitational redshift by quasars because the “fuzz” surrounding certain quasars is of the same redshift as the quasars. Mitchell has opposed this argumentation by saying that “reflection” of quasar radiation from surrounding dust may cause the fuzz75. Actually, if it turns out that there is no gravitational redshift in the case of quasars then the on this website suggested AGN model does not have a problem. On the other hand: on this website quasars are considered to be AGN types with strongly concentrated compact sources, so one may expect a certain gravitational redshift. One may compare big/small quasars having high or low gravitational redshift with stars. Both big and small stars can have a big heavy element core (high gravitational redshift) or a small heavy element core (low gravitational redshift) relative to the amount of surrounding gas (6-2). Quasars can have a large “big ball” (5-1) (big quasar) or a small “big ball” (small quasar) and the more concentrated the masses (less space between the objects) in the “big ball” the higher the gravitational redshift. When quasars of high redshift are close to a galaxy with low redshift and clustering around the galaxy then this may mean that the galaxy by coincidence lies in front of a cluster of quasars (with high tired light redshift) far away or it may mean that the quasars (with high gravitational redshift) are close to the galaxy. If very strong gravitational redshift exists then objects with different redshifts can be at the same distance, as may be the case in the following image of the Seyfert 1 galaxy NGC 7603 and its smaller companion NGC 7603B, taken by M. López-Corredoira and C. Gutiérrez73 in 2002. NGC 7603 (z = 0.029) and its companion NGC 7603B (object 1, z = 0.057) are apparently connected by a luminous filament. In the luminous filament (z = 0.030 ± 0.001) there are two compact broad emission line objects: object 2 (z = 0.243) and object 3 (z = 0.391). 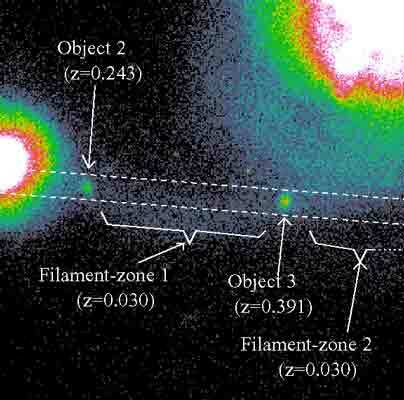 López-Corredoira and Gutiérrez73 took spectra of the two knots imbedded in the luminous filament and found two compact, broad emission line objects with redshifts z = .243 (object 2) and z = .391 (object 3). NGC 7603B (object 1) may originate from a hydrogen deficient galaxy or g-galaxy that may have been fuelled (and may still be fuelled: the luminous filament) with gas from NGC 7603. When AGNs originate from old hydrogen deficient galaxies or g-galaxies that have shrunk to spherical or disk shaped objects (consisting of old blackened stars or rather: dark matter objects) that get fuelled by hydrogen (5-1) then it may be a matter of time before a Broad Line Region in NGC 7603B (i.e. broad emission lines) shows up. Thus NGC 7603B may be a “ball” of dark matter objects that has shrunk very much and so it may not be a coincidence that NGC 7603B is smaller than NGC 7603 and (appears to be) more spherical (because it is in a further “shrunk” state, see also 4-3). The smaller quasar like objects 2 and 3 may be in an even further “shrunk” state and therefore may have even higher redshifts (in the case they turn out to be part of the system indeed, which would make them quasars with high gravitational redshift and low tired light redshift, 5-4). Because of being in a further “AGN evolutionary state” a Broad Line Region may have showed up in objects 2 and 3, which then may explain the by López-Corredoira and Gutiérrez measured broad emission lines73. With Seyfert NGC 7603 having the same redshift (.029) as the luminous filament (.030 ± .001) NGC 7603 may be an example of an AGN that has not become so strongly concentrated/shrunk (yet) that light is strongly redshifted by gravitational redshift. The fact that NGC 7603 is more a disk system rather than a spherical system may be an indication for this “not much shrunk yet” state (4-3, 5-3). When the redshift of the luminous filament turns out to be a little higher than the redshift of NGC 7603 then NGC 7603B may be closer to us than NGC 7603 and then the gas may be blueshifted because of its velocity from NGC 7603 to NGC 7603B (which would mean that NGC 7603 may be a little redshifted by gravitational redshift too, i.e. when the blueshift by the velocity of the gas would be higher han .001). If the light in the luminous filament is blueshifted then perhaps small redshift variations can be found in the luminous filament due to different velocities of the gas in the filament while moving from NGC 7603 to NGC 7603B. If gravitational redshift causes part of the redshift of NGC 7603B then the redshift of the outward parts of NGC 7603B may be lower than the redshift of light coming from the nucleus of NGC 7603B. It may be interesting to try and measure this. 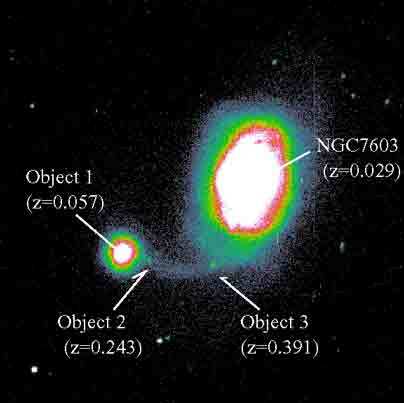 If the 4 objects of the NGC 7603 system are all part of one interacting system then the NGC 7603 may be likely to be a g-galaxy as described in 4-1 in order to be a stable system. This may mean that the system may have dynamics as shown in Fig. 5-4-VI. Possible dynamics in the NGC 7603 system. Astronomical systems may have certain dynamics in order to become stable and enduring (4-1). Directions of rotation and directions of orbiting may have to be the same in order to have a stable system (7-1). When the NGC 7603 system is a g-galaxy that is seen face-on then all the 4 objects may have sidereal rotation as indicated in Fig. 5-4-VI with the curled arrows in NGC 7603 and NGC 7603B. And the objects 2 and 3 may be orbiting NGC 7603B and NGC 7603 respectively with the same direction of orbiting as NGC 7603 and NGC 7603B are rotating around their axes, also as indicated in Fig. 5-4-VI. If so then NCG 7603 and NGC 7603B are likely to orbit each other in the same direction as well (not shown in Fig. 5-4-VI). The Sun is rotating faster around its axis than the planets are orbiting the Sun and the nucleus of our Galaxy may be rotating faster than the spiral arms (4-3). This also may be a necessity for astronomical systems to be stable. Thus object 3 may orbit NGC 7603 slower than NGC 7603 is rotating around its axis, which then may explain why we see gas moving to object 3 from object 3's right side in Fig. 5-4-VI. The curve in the luminous filament may be explained by objects 2 and 3 respectively orbiting NGC 7603B and NGC 7603 as indicated in Fig. 5-4-VI. Perhaps it is possible to verify this way of looking at the dynamics of the NGC 7603 system in the same way the orbiting directions of galaxies were measured recently with the Chandra X-ray Observatory30: by imaging the “tail” a galaxy gets by moving through intercluster gas. Object 3 may show a gas tail at its north-west, though perhaps it is hard to find a tail for object 3 when it is fuelled with much gas coming from the right side. It may be more likely that object 2 shows a gas tail at its south-west side (though here also is the problem with gas that may be more abundant at the north-west side of object 2 when object 2 orbits NGC 7603B slower than NGC 7603B rotates around its axis). One may wonder about quasars orbiting NGC 7603 at such relatively short distances. In 3-2 it is argued that with pushing gravity high-density objects, like the X-ray pulsar Centaurus X-3, may orbit their companions at relatively short distances. When quasars descend from shrunken galaxies or g-galaxies as advocated on this website (5-1) then they are extremely compact objects and then quasars may orbit companions at relatively close distances. Arp, Burbidge, Chu et al (2002)28 argue that quasars may be as near as the starburst/AGN galaxy NGC 3628. In Fig. 5-4-VII conspicuous many QSOs (8) and objects that are suspected to turn out to be QSOs (7) are close to the main galaxy NGC 3626. The black rectangle in the center of dashed line is neutral hydrogen (HI). The main galaxy NGC 3628 is embedded in the rectangle. Catalogued quasars are annotated with their redshift values. Objects marked with a circled X are probable quasars plus F, a possible quasar (picture copied from the article by Arp, Burbidge, Chu et al28). If the circled X objects turn out to be quasars indeed then we see 5 pairs of quasars: E and D; B and z = 1.75; z = .995 and z = 2.15; z = .408 and z = 2.43; C and z = .981. If we take a look at our Local Group we also see pairs, but then pairs of galaxies, like Leo I and II, LMC and SMC, Sculptor and Fornax, Draco and Ursa Minor, NGC 185 and NGC 147, NGC 205 and M32. In Fig. 5-4-VII we see 4 objects that lie in a certain position with respect to 4 pairs, i.e. with the line between the more distant objects and the pairs (more or less) perpendicular to the line that connects the pairs: F with respect to E/D; A with respect to B/1.75; z = 1.94 with respect to .408/2.43; z = 2.06 with respect to .995/2.15. They form 4 “T-bones”. Only one object (z = 1.46) is positioned far from the rest (though it may be seen as being in a system with z=.981/C; a system that more or less may have been ripped apart because of gravitational forces by the main galaxy NGC 3628 and other quasars). Such T-bones may be 2-to-1 systems (4-3). If quasars descend from galaxies then our Local Group may be interesting in an other way. Both the top view of our Local Group as well as the side view of our Local Group show a T-bone: our Galaxy versus M31/M33. Thus perhaps that in the very far future our Galaxy and M31/M33 may have shrunk very much and may have come to lie as a T-bone 2-to-1 quasar system around a main galaxy as in Fig. 5-4-VII. Perhaps that the small galaxies of our Local Group are not big enough to become quasars, but also: perhaps they do become quasars and perhaps that much later (when the quasar states of the smaller galaxies have vanished) our Galaxy and M31 and M33, being bigger, become quasars. In Fig. 5-4-I and 5-4-III one can see that there may be regions in space with certain (luminous/nonluminous) mass assemblages. Small regions that, together with a number of other small regions, are part of a larger region that, together with a number of other larger regions, etc. I call such regions chappells, after Dr. John E. Chappell, Jr., who founded and directed the Natural Philosophy Alliance1. There may be chappells in all kind of magnitudes, parallel with clusters that may exist in larger and larger (super)clusters. I call the region of space that is connected to our Local Group our Local Chappell, the region that is connected to our Local Supercluster our Local Superchappell and the region that is connected to the Great Attractor the Great Chappell and a region that goes (far) beyond that a Major Chappell. The space connected to the Hercules cluster I call the Hercules chappell, and the space connected to the Coma cluster the Coma chappell, etc. The space connected to the Hercules supercluster I call the Hercules superchappell, and the space connected to the Coma supercluster the Coma superchappell, etc. Perhaps that quasars with high redshifts (i.e. high tired light redshift, low gravitational redshift, 5-4) can be centers of major chappells. The region of space connected to our Galaxy I call our Galaxy Chappell, and the region connected to M31 the I call the Andromeda chappell. Thus there is a difference between, for instance, a supercluster and a superchappell: speaking about a supercluster is addressing a particular assemblage of matter, speaking about a superchappell is addressing a particular region of space. A chappell is often tied to a particular assemblage of luminous matter, but a chappell may also be a certain region in space without luminous matter but with (perhaps very little) dark matter. Very many little dark matter amounts spread over an enormous big empty region may collect hydrogen and thus (over extremely long times) a large nonluminous void may become a (luminous) supercluster. [October 2003: Perhaps galaxies originating this way may be the low surface brightness (LSB) galaxies that have been found the last decade. There is strong evidence that the accretion of cluster galaxies triggers starbursts. A major question for astronomers is that this type of activity declines so rapidly from z= .5 to the “present”. This question may be answered by the state-of-our-Chappell. The Universe may be homogeneous on extremely large scales, but with all kind of chappells in all kind of magnitudes and (astronomical evolutionary) phases, it is not homogeneous on smaller scales at all. When superclusters (4-1) shrink to g-galaxies (4-1) then there are early type superclusters/g-galaxies and late type superclusters/g-galaxies. Or: certain matter assemblages, like universal engines and g-galaxies, galaxies, clusters and superclusters, in certain regions of space may be in certain “evolutionary states”. The region within z= .5 may be relatively young (or, at least, be in a certain evolutionary phase) and thus starbursts by accretion of clusters may not occur that much. But also: with tired light redshift instead of expansion redshift (and no relativity) larger “z-distances” will be much further away than thought so far (5-3). Thus the declination from z= .5 may be an apparent declination. 4 quasars around the famous radio quasar 3C 345, see Fig. 5-4-VII: A (z=.59), B (z=.70), 3C 345 (z=.59), D (z=.63) and E (z=.54)29, may be in a, what I call, quasar system. Perhaps this can be an example of quasars/AGNs behaving like galaxies/clusters orbiting each other (4-1). The upper part of Fig. 5-4-VIII shows the positions and redshifts of the 5 quasars as they are observed in the sky. Possible example of a quasar system. If we look at the cross on the line in the lower part of Fig. 5-4-VIII: imagine that that cross is the center of the system. Around this central point 3 systems are orbiting: binary system A/B, 3C 345 and binary system D/E. The cross then is at a certain distance. If one puts this distance at (tired light/distance) redshift z=.62 and puts, for the sake of simplicity, all 5 quasars at exactly the same distance, i.e. z=.62, then one can figure out a way of how the 5 quasars may have particular orbiting velocities in the quasar system, thus having different Doppler redshifts, accounting for the differences in the observed redshifts of the quasars. The lower part in Fig. 5-4-VIII shows with arrows how the quasars may orbit each other. For the sake of simplicity it is presumed that all quasars have orbits that are in the plane that is determined by the line-of-sight and the line (perpendicular to the line-of-sight) in the lower part of Fig. 5-4-VIII on which all 5 quasars (are presumed to) lie, i.e. all quasars (only) either move towards us or from us away. The above “calculation” is, of course, very arbitrary. For instance: I took A and B (and also D and E) as binary systems in which the components have the same mass, thus having the same but opposite Doppler redshifts, but this may not be the case if the quasars do not have the same mass, i.e. if A does not have the same mass as B, and if D does not have the same mass as E.
Thus reality concerning the quasar system (if a quasar system) probably is different ( [June 2003: especially when the redshift of quasars is also due to gravitational redshift, 5-4 End June 2003] ), I just liked to show a possible example of a quasar system and a way of looking at such a quasar system, as with this case in Fig. 5-4-VIII, in which we may look “edge-on”, and thus we may not see a “disk”, but a “line” on which the quasars lie. Velocities like 16,500 km/s are high velocities. Quasars are likely to be compact systems, i.e. high density systems. Such systems may be able to move at high velocities because of relatively small inertial forces by gravity particles (3-2). A normal galaxy, having a much lower density, may not be able to reach such high peculiar velocities. Perhaps there is quantization in the cosmic background radiation (CBR) restframe (there is according to Tifft27), if parts of the CBR are bound to certain regions/chappells in space which may have certain peculiar velocities (4-2). The Einstein cross consists of 4 quasars, each with the same z-value, and thus this may be a case of “disk”-clustering where we see “face-on”. But perhaps the Einstein cross can be explained in another way as well. When you take the above mentioned marbles (5-4) or if you take fine spherical oranges and you pile them up you will see endless rows of tetrahedrons. If indeed, as mentioned in 5-1, there is AGN clustering, and thus also quasar clustering, one may every now and then expect to see quasars clustering in the shape of a tetrahedron (5-4). Current conventional science thinks that the Einstein cross is the result of gravitational galaxy lensing. Arp opposes this strongly29. Perhaps the 4 quasars (with z=1.70) of the Einstein cross is an example of quasar tetrahedron clustering (see Fig. 5-4-IX). The image of the Einstein cross may be the two-dimensional image of a tetrahedron. The foreground galaxy (with z=.04) that is in the middle of the 4 quasars (not shown in Fig. 5-4-IX) would then be there by coincidence. [June 2003: I now agree with Arp that it may be possible that the 4 quasars are at the same distance from us (because of gravitational redshift, 5-4; Arp connects redshifts to the age of mass29) as the central 14th magnitude galaxy of z=.04 (not shown in Fig. 5-4-IX) that is in the middle of the 4 (z=1.70) quasars and which seems to show evidence of interacting with the quasars on images29. Arp reasons that the 4 quasars have been ejected from the central galaxy where I argue that the 4 quasars have slowly approached each other (and, perhaps, the central galaxy at z=.04, i.e. in the case gravitational redshift is (mainly) responsible for the z=1.70 instead of tired light redshift mainly being responsible).